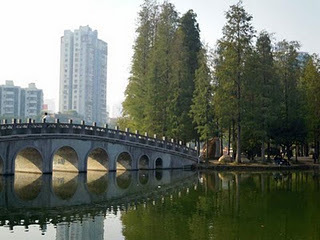 My favorite place in shekou is Si Hai Park, which is the biggest park in shekou. There, you can walk your dog, ride your bike or just relax. Si Hai Park is a perfect place for anyone even if you’re a little ked or an elder. A famous statue in the park is a huge black Taurus the size of a four-story tall building. The Taurus is in battle armor with a flaming tail and a fire ball on its back. It stands furiously in the center of the park. Emerald-green grass surrounds the statue, and you can see many schoolgirls reading quietly nearby. On the surface of the lake, lotus flowers bloom and crowd each other. The flowers are pink, white, yellow, or purple with a yellow center; resting on green lily pads. The crystal waters reflect the blue sky and the white clouds. You can constantly hear the joyful laughter of the children playing around. Under the big stone bridge, hundreds of fish swim swiftly through the waters. They are white, with yellow, orange, and red spots. Some people will feed them from the bridge, and about 50 large fishes emerge from the waters at once. 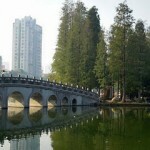 Si Hai park is a peaceful place. There are flowers, green trees , blue waters, and you can hear the birds chirping and singing in a beautiful melody in the trees. Date: QSI Middle Students has written 50 articles. What is the BEST investment over the next 5 years? sherry lee: A simple story with great words…I love it. Glenda: Hi there, I enjoy reading through your article post. I wanted to write a little comment to support you.